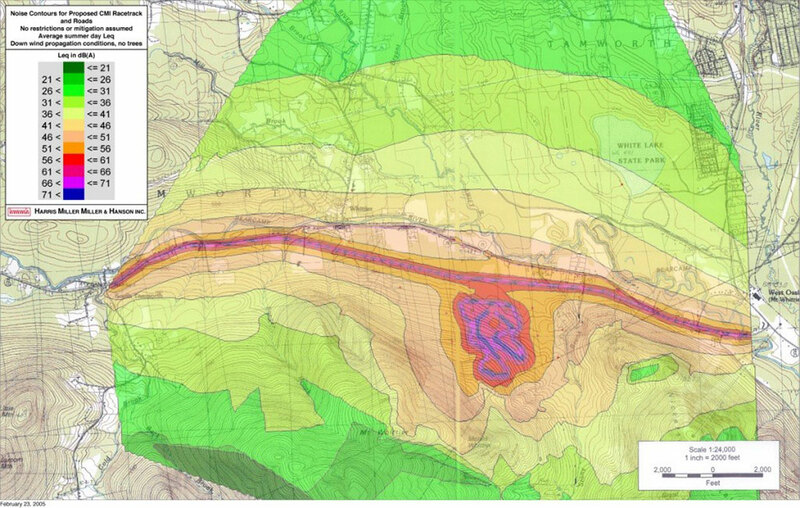 HMMH conducted a noise analysis study for a proposed club racetrack facility in Tamworth, NH. The Tamworth Foundation desired a balanced, neutral noise evaluation that would address both the concerns of citizens who feared that noise from the facility would adversely affect their town; as well as the interests of other Town citizens who desired the facility for the economic benefits it would bring. Since no noise or zoning regulations were applicable, HMMH’s analysis focused on the expected average community reaction from the facility. HMMH conducted reference noise measurements of race vehicles during a club race at New Hampshire International Speedway to provide valid comparable noise emissions data for the SoundPLAN modeling analysis. HMMH’s analysis addressed busy days as well as average days, and recommended property line noise limits that would allow the facility to operate with all but the noisiest modified vehicles yet minimize the impact and audibility of racing noise at the nearest homes and throughout the Town. The Tamworth selectmen and the Town adopted the property line noise limits, and the facility opened in 2016.